Daya Maxflo is the technology representative in Asia Pacific (Malaysia, Thailand, Myanmar, Indonesia, Brunei, South Korea, Vietnam, Laos, Cambodia, Japan and the Philippines) to sell or perform the Jorin’s products & services. Jorin is a company involved in oil in water analysis and process optimization. Jorin Limited is a UK instrumentation company, designing and manufacturing on-line particle analysis systems based on video imaging technologies. The Jorin ViPA, Visual Process Analyser, provides information on oil drop size, oil concentration, solids size distribution and solids concentration which is a critical set of data for understanding and controlling produced water separation systems. ViPA analysers have been operating successfully in diverse applications around the world for more than 10 years. The Jorin ViPA, is an on-line instrument that can be used for monitoring the physical characteristics of multiple classes of dispersed objects within a given process stream or recirculation lab sample. In complex multi-phase systems these dispersed ‘objects’ may include any mixture of solid (particles), liquid (droplets), gas (bubbles) or macromolecular (e.g. high molecular weight polymers, micelle agglomerates etc) species. The ViPA system uses image analysis techniques and sets of user-defined descriptive parameters (such as shape factor and optical density) to differentiate between the various species of objects present within a sample and then outputs the physical information on each of these independently. Model B – The compact and robust ViPA analyser is equally at home on a process line or laboratory bench, its stainless steel construction and flow cell rated for continuous use at 120 Bar are ideal for use in harsh environments. Model FZ – The FZ2 takes the ViPA technology into hazardous environments and is ATEX Certified for Zone 1 (Ex P IIC T4) or provided with documentation for Class 1 Div 1. This certification is achieved by the addition of a purge controller using instrument air. Model MZ – The MZ is a mobile solution for use in hazardous areas and is Jorin’s primary process survey and test tool, available with or without an operator on a rental basis. Besides ViPA, Jorin are also involved in oilfield water consultancy. Often the most valuable data is the data received fastest and Jorin’s Process Insight services focuses on providing high quality data, quickly in the field. Using online and field portable tools, Process Insight is a complete consultancy service for oil and gas fluid behaviour during production, sea water injection, waste water treatment and produced water injection projects. These studies encompass various project stages, from conceptual and detailed design to final plant commissioning and operation. Process Insight is provided by Jorin Ltd. whose employees have experience of oil and gas production and water injection projects in Africa, the North Sea, the Middle East, Asia, North America and South America. This experience includes both offshore and onshore projects and covers heavy oil production, gas production and water injection in seawater, aquifer water, river water and produced water system. From fluid characterisation and equipment selection to performance verification, with data collection in real time at site and recommendations made completely independently of all vendors. Independent and fast, online measurement of comparative performance for instant quantitative data. From equipment specification to compatibility studies, among the most fundamental requirements in process design. 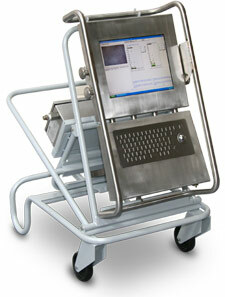 Online analysis for a fast and holistic treatment of existing process equipment to maximise total process performance.